Luckily for you, I found a secret way to cut straight to the best spring dresses that the internet has to offer. It all comes down to using this one search phrase when online shopping. And it pretty much works on every site from Zara to Net-a-Porter. Hint: You'll want a spring dress with sleeves, so you can actually start wearing it ASAP. 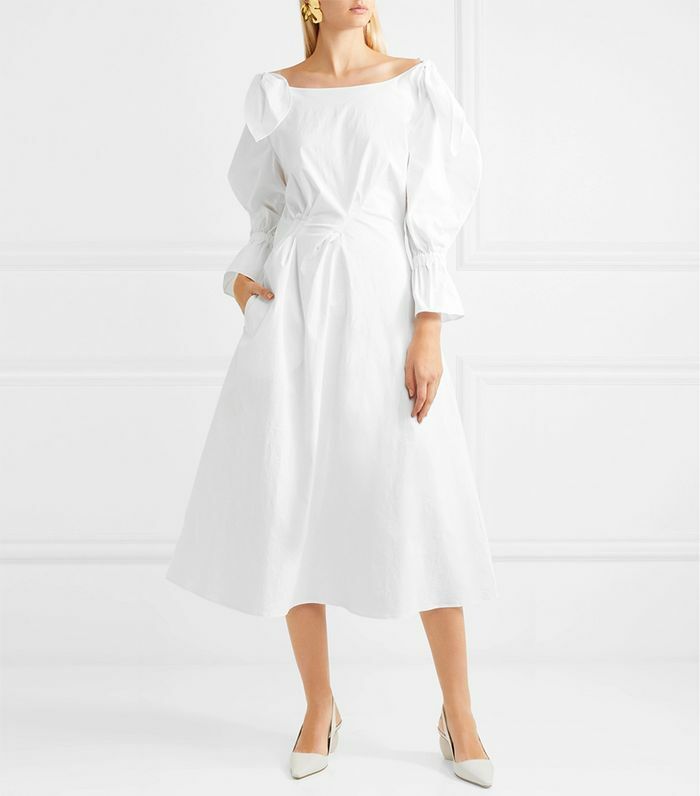 I found that by searching "puff sleeve" or "puffy sleeve" and "dress" on my go-to shopping sites, what manifested was the prettiest, breeziest selection of dresses that instantly put me in a springy state of mind. From lightweight linen dresses to Victorian-inspired designs, you'll want to live in all the below styles all through the summer. I went ahead and shopped the coolest dresses that my search found. Just add strappy sandals or sleek mules and you've nailed this spring trend. We first noticed the arrival of the puffy-sleeve trend from this editor-favorite UK label. This dress has already sold out once and is already on its way to being sold out again. Shop accordingly. Anything the site Lisa Says Gah styles, we pretty much want. Available in sizes UK 6 to 12. The color and sleeves on this dress are giving us a lot of feelings. L.A. girls will wear this one dressed down with flat sneakers. Available in sizes 32 to 36. Square necklines are having a moment right now. Make this peasant dress your go-to weekend look. We'd pair this vintage-inspired dress with these lace-up boots. Just add a mini bag and you're so spring 2018. Try not to fall in love with this light buttermilk shade—we dare you. There aren't many off-the-shoulder dresses right now, but this one is winning us over in a major way. Ideal for frolicking through a garden… or, you know, wearing to grab coffee. This color is called "poppy," and it's honestly changing our minds about orange. Pretty, playful, and perfect polka dots. See what we did there? Meet your new go-to summer dress. This one looks great in every color. Now you're ready to nail the puffy-sleeve dress trend this spring.